We’ve all heard the phrase “fighting like cats and dogs,” but is living out this old cliché really the only way? When two different species are living in the same home there is bound to be some tension. However, it is possible to create a happy living environment for all humans, dogs, and cats involved in your household. Just remember to stay positive and patient. It’s best to introduce pets when they are kittens and puppies. Older animals have developed a set way of doing things and are much less likely to welcome change—even if it’s especially cute and cuddly. Also, neither kitten nor puppy has an existing claim on the shared territory. The downside of this is that you will have two baby animals full of curiosity and energy in your house at the same time, and that can be a handful. Luckily, it’s still possible to successfully introduce older animals. You can take some steps before bringing home a new furry family member to make the introduction easier. Ask the shelter or rescue workers if they have a dog that has lived with cats before, or try to arrange seeing the dog with a cat before you adopt him. If your dog is the established pet and you’re looking to bring home a cat, arrange for some pre-adoption training sessions. Make sure you can control him on a leash and that he responds well to sit and stay commands. Don’t forget to give him lots of praise and attention. The first day is crucial. You can’t just throw the pets in the same room and hope for the best. 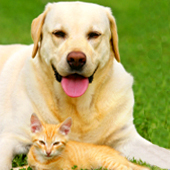 You need to introduce cats and dogs to each other gradually. First, make sure to keep your cat in an enclosed area. Even if your cat is the existing pet in the household, it makes sense to sequester her since cats usually require less space. Keep her in a bathroom or bedroom with food, water, toys, and a litter tray for the first few days. This way, you can slowly let the animals get accustomed to the strange smell of a different species. Rub a towel over the dog and let the cat smell it, and then vice versa. There may be some barking or hissing if they can smell each other through the door, so make sure they’re far enough away so they don’t get too stressed. On the second day, let the pets switch places for a little while. This will give the cat a chance to explore if she’s the new addition to your family. Put your dog on a leash and open the door to the cat’s room, allowing the animals to see each other face to face. Make sure you have complete control of your dog and don’t let him play with the cat, chase her, or try to chew on her. Hissing and baring their teeth is normal. They should also be curious about each other. The cat should always have a way to escape the dog, since dogs are usually bigger and can usually do more damage. Make sure the cat can hide under a bed or get to a room where a childproof gate stops the dog in case she feels threatened. When the pets behave, praise them both lavishly. Continue to keep your pup on a leash until they are less interested in fighting, and then you can allow them more freedom. Cats often prefer high places, so try a bookshelf or cat tree to give her a place free from dog interference, and to give the dog the space he needs as well. Barring any rare, unsolvable animosities, you and your pets have many years of cuddling and mutual affection ahead of you. If you remain patient and praise them both equally with love and attention, you can create a peaceful home for everyone. Copyright © 2011 Intervet International B.V. All rights reserved. PEANUTS © United Feature Syndicate, Inc.